"Taliesin, Taliesin, Taliesin, this is Just Get'n By." "Just Get'n By, this is Taliesin." "One of our crew just passed out for 15 seconds. They're awake again, but out of it, pale, and they have a weak pulse." Thus started our ninth day underway. This year we're blessed with a variety of medical professionals: four nurses, four veterinarians, one orthopedic surgeon. Today, we put a few of them to use. The passenger passed out near Addenbroke Island, in Fitz Hugh Sound. The doctor was aboard in about 15 minutes. He didn't have a blood pressure cuff with him, but another boat about 3 miles behind us did. I hopped in the dinghy, retrieved that cuff, and delivered it to the doctor. Canadian Coast Guard cutter Tanu was also nearby. They dispatched their inflatable and were on scene within about 30 min. 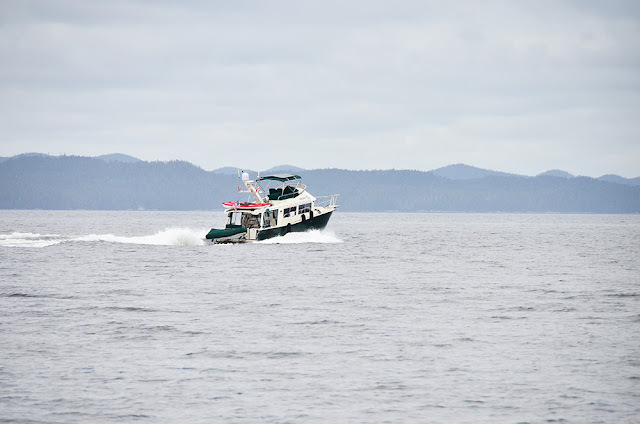 Together, the doctor and the Coast Guard decided the passenger should be seen in a clinic ASAP. 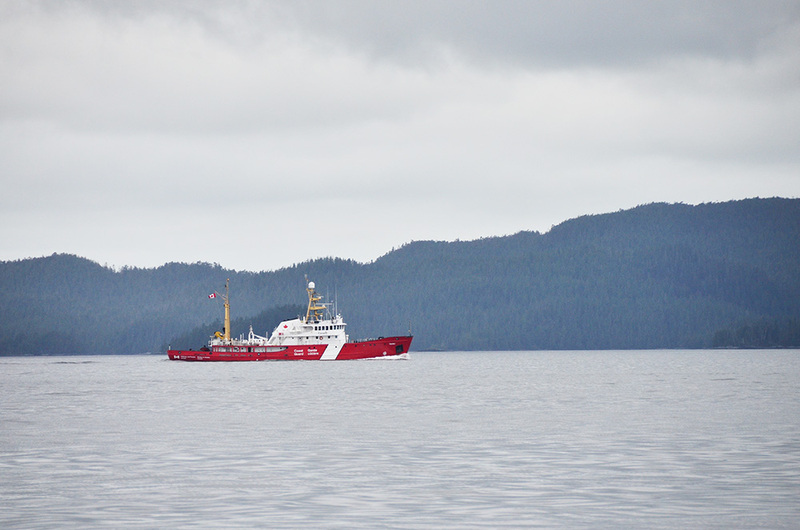 Bella Bella, a native community with a medical clinic, was about 34 nautical miles away. Just Get'n By could make about 12 knots. The Coast Guard inflatable could make 30. Taliesin, a 40 foot Coastal Craft with 435 hp Volvo IPS drives, could cruise at 29, and the passenger would be much more comfortable than she'd be in an open inflatable boat. A few minutes later the passenger was transferred to Taliesin and they were out of sight. 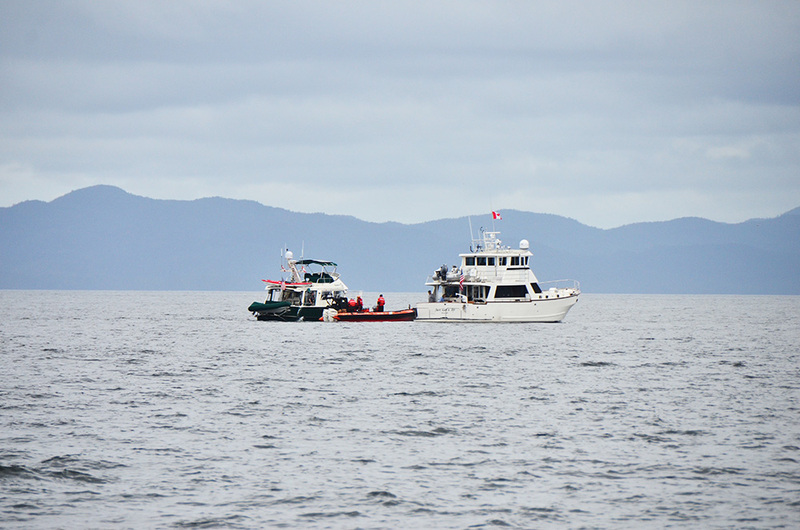 By the time we arrived in Shearwater (just a couple miles from Bella Bella), the passenger had been seen by a doctor and discharged. Nothing wrong, no diagnosis, only a theory that recent changes in blood pressure medication might be involved. Needless to say, we were all relieved by this outcome! 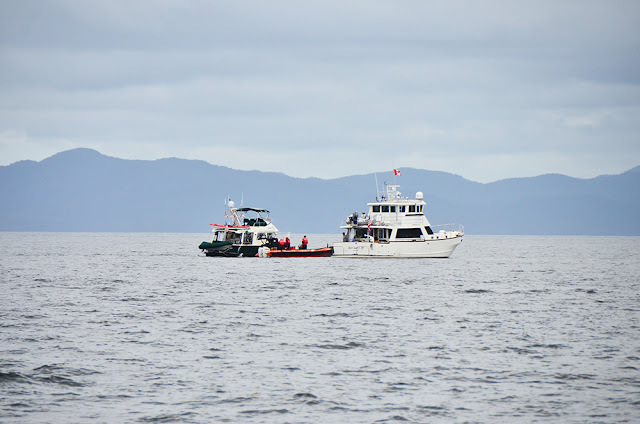 Thank you to everyone on the flotilla for standing by with whatever medical supplies and expertise they had, the doctor aboard Taliesin for seeing the passenger quickly and transporting her rapidly to a clinic, and the Canadian Coast Guard for their quick response and coordination. Other than this excitement, we had a great day underway! We're well ahead of schedule and will take a rest day here in Shearwater. Then on to Ocean Falls. We missed Talisin last year. So glad Talisin was with you this year! Talisin and her skipper are a great addition to any boating adventure!